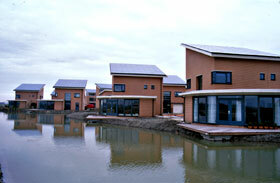 Summary In this experiment three types of houses are supplied with a complete PV roof system. The project is part of the larger program 5MW-HAL-project ?City of the Sun?. The PV rooftop is integrated in the roof design. Attention has been paid to the water tightness, the engineering details of the crest and the gutter of the roofs as well as other details of the roof. In total 130 kWp PV power has been realized on 23 roofs of houses with 3, 5 and 8 kWp each.